Yippee-Kai-Yay [insert profanity]! That’s one of the many hilarious Easter eggs that Twisted Pixel Games have put into their new game LocoCycle. 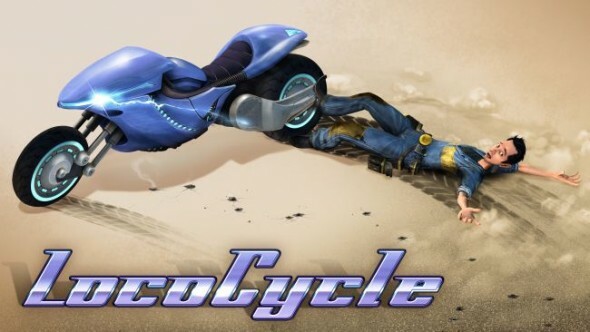 LocoCycle is a new action racing game that features the life of a high tech bike! Weird? Yes it is! The story starts off with a company named Big Arms. Big Arms is an international technology manufacturer and has just made two of the most powerful weapons on earth: I.R.I.S. and S.P.I.K.E. They aren’t just ordinary guns or rockets, they’re motorcycles! Big Arms holds a secret auction with countries from all around the world to bid on these weapons. 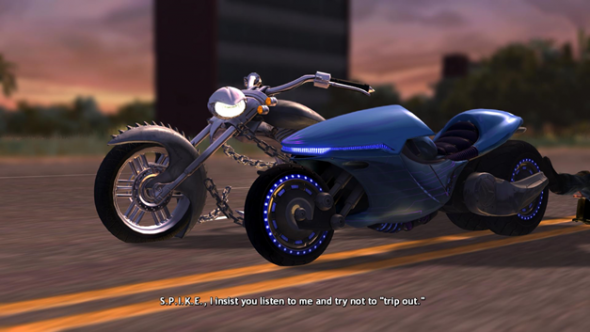 The motorcycles are fully equipped with weapons and the most futuristic technology. They can understand and speak all languages there are and they have a mind of their own. Trouble starts when security brings the motorcycles back to the garage. I.R.I.S. is hit with a lightning strike which fries her systems! Pablo is put in charge to repair the motorcycle. Things completely go wrong as I.R.I.S. fires up and sees herself watching a commercial about the Freedom Rally in Scottsburg, Indiana. She is now obsessed with getting there, and what’s worse for Pablo, he is stuck to her with his leg. There’s even a more hilarious turn when he finds out the bike’s language module is broken, she can only understand and speak English. And guess what, Pablo is Mexican. The story then unfolds as S.P.I.K.E. has gotten the job to stop I.R.I.S. at all costs, dead or alive! There’s even more story to it, but I’ll leave that to you to find out! The graphics in this game aren’t the best, but they’re not horrible either. The video menu shows some simple options which allow the change of resolution, full screen or windowed, vsync, shadows and more of that fancy stuff. The story cinematics that once in a while show up are pretty cool though. The developers made an actual movie out of it, with real actors! Every time an important piece of story unfolds, a “real” cinematic will play. Not only is this really cool, it’s also funny to see a Mexican that’s stuck to a motorcycle. Music and sound effects are pretty nice. 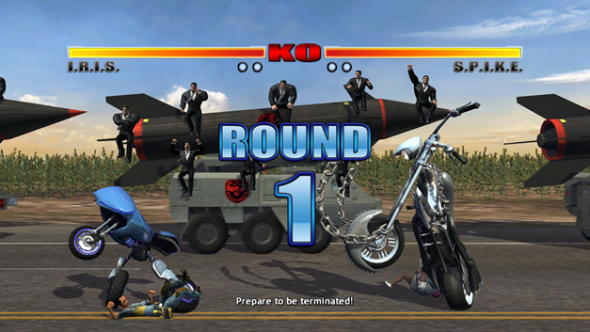 The music is typically the type of music you would expect from any action game, loud, fast paced music in order to keep up with the gameplay. 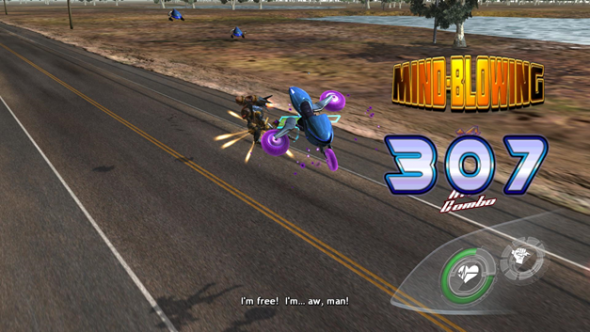 Sound effects are also good, the bikes and cars actually sound like real bikes and cars, which is pretty mandatory in a game about bikes. Voices are spoken by their corresponding actors in the story cinematics and they sound awesome! I.R.I.S. has a Glados-like voice and talks rather robotic but S.P.I.K.E. on the other hand sounds like a real villain! The developers have also taken care of a healthy dose of Easter eggs for the bikes, so hilarity is guaranteed! The game is all about making it to the Freedom Rally at all costs. And since you are dragging Pablo behind you, you decide to use him as a weapon, poor Pablo. Controls are relatively easy and the game supports controllers, always a nice feature! The UI is pretty simple too, you have your HP, turbo and gun bar at the bottom right, on the bottom left you get a little radar now and then. Nothing fancy, not too busy either. First of all, the game works with a score system. Each world is divided in levels, like in the old school arcade games. After every world, you get an upgrade screen where you can either upgrade your melee abilities, ranged abilities or survivability. Better upgrades get unlocked by playing though the worlds, upgrades include extra damage, more HP, a drone which helps you when you have a 10 hit combo etc. Very basic stuff, no extra abilities or buttons you have to worry about. What’s really different though is the combat system. You can actually melee with your bike, which is weird at first, but it’s actually pretty sweet. While performing melee combat, you can throw Pablo to your enemies in order to do extra damage or interrupt their attacks. The game isn’t all about melee combat though, you are a bike so obviously you are driving. While driving, you encounter Big Arms trucks, bikes, cars etc. You can take them out by using your turbo to get up close and melee or you can use your mounted guns on your bike, but the guns are the most efficient by far. Sometimes there are bonus objectives which require you to kill a certain amount of cars in a certain amount of time, smash through a Big Arms roadblock within the time limit etc. Occasionally there are boss fights, whether it’s fighting off S.P.I.K.E. or killing a giant robot, fun is guaranteed! LocoCycle is a must have for anyone who likes an arcade approach in games. The combat is very rewarding as you’re trying to get your hit counter up as high as possible. Voices and cinematics are great and the Easter eggs are hilarious! Overall it’s a very fun game for the casual gamer who enjoys a little bit of humor here and there. Be sure to check out the live action trailer!